This is a consolidated and literally perpetual calendar system. It is a proposed contribution to the on-going efforts to yield a highly adaptable and acceptable approach to reform the current Gregorian Calendar. It is designed to provide as many as possible of the beneficial attributes listed below, with the least change or deviation from the current and the familiar; the already well accepted concepts, customs and conventions. Simply put: "The most benefit for the least cost." So, what all should it have? July has 30 days - in every year. This is it. All of it. There are no more actual changes to be considered. Any further differences that may appear would derive from a maturing perception of reality. LEAP YEAR: Also known as 366-day year, Long Year, Full Year. LEAP YEAR RULE: Formula to determine which years will be Leap Years (or not). Current formula reads: "Every year will be considered a Leap Year if its Year Number is divisible - without remainder - by the number 4, except if it is also divisible by the number 100, unless it is also divisible by the number 400." This rule may need upgrading - by rephrasing - occasionally, following regular, periodic reviews. This, by the way, is the only adjustment the system needs to remain current and accurate, in the face of the incessant change that is the nature of the Universe. This current rule assigns 97 Leap Years and 303 Common Years in every 400 year calendar cycle. Or it could be described as the "970/3030 ratio, 4000 year cycle". In general, cosmic changes trend to reduce the Leap Year ratio in the direction of zero and conceivably even beyond zero. 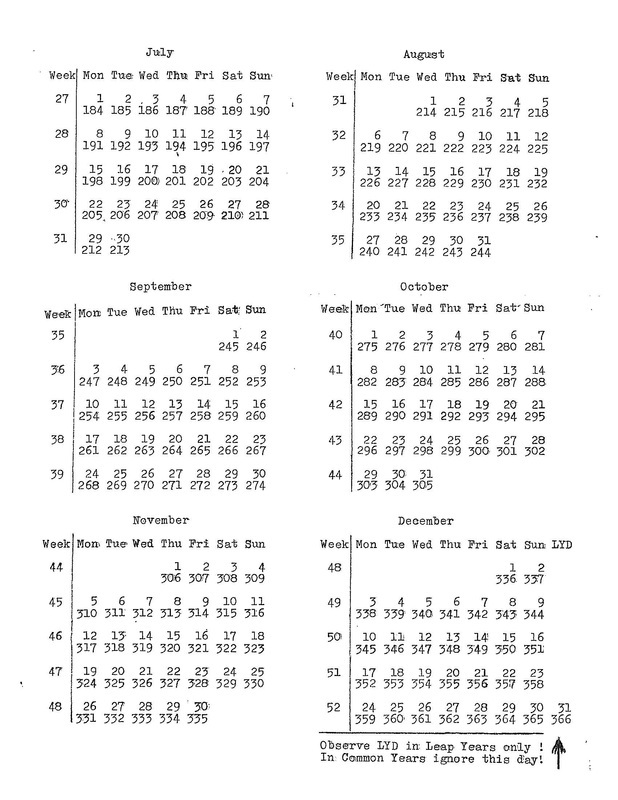 This phenomenon softens the impact of exceptions, as used in calendar design, by showing them up as increasingly temporary and in the process of correction. COMMON YEAR: Not Leap Year, 365-day year, Short Year. CORE YEAR: The Core of the Year, consists of 364 regular days, each with its regular Weekday designation, begins Monday, January 2 and ends Sunday, December 30, every year. A period of one - or two - Special Days follows consecutively, to complete the year. SPECIAL DAYS: As an exception, these days have no weekday designations, but are known by their traditional Special designations, LYD for Leap Year's Day and NYD for New Year's Day. Their presence has a buffering effect on the variability of the year. HALF YEAR: Six months or 183 days in both halves of Leap Year, one day less in the second half of Common Year. MONTH: Twelve months in a Year; January to December, 30 or 31 days long each. BIMO: Six bi-monthly periods in a Year, formed by consecutive pairs of months, 61 days long each, but one day less in the last Bimo of Common Year. 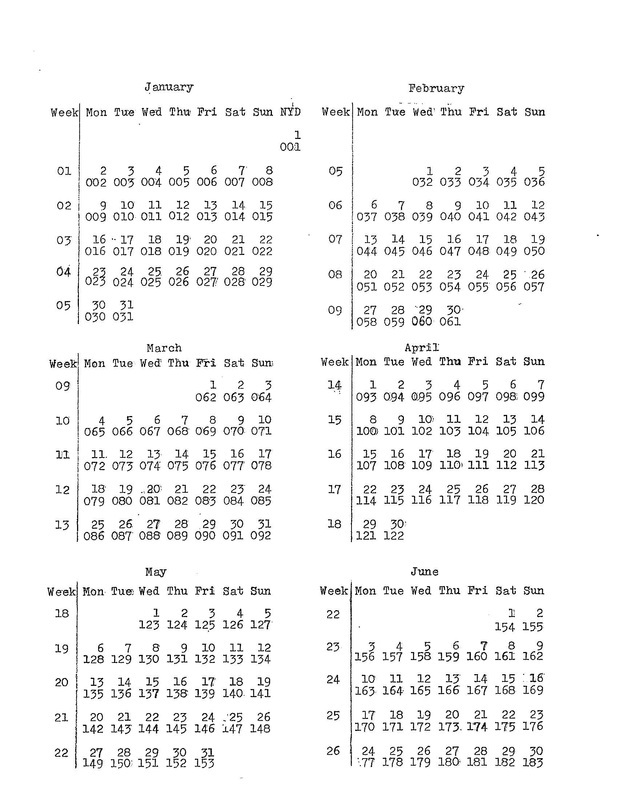 ATTACHED: Please find your copy of the complete CALENDAR following.